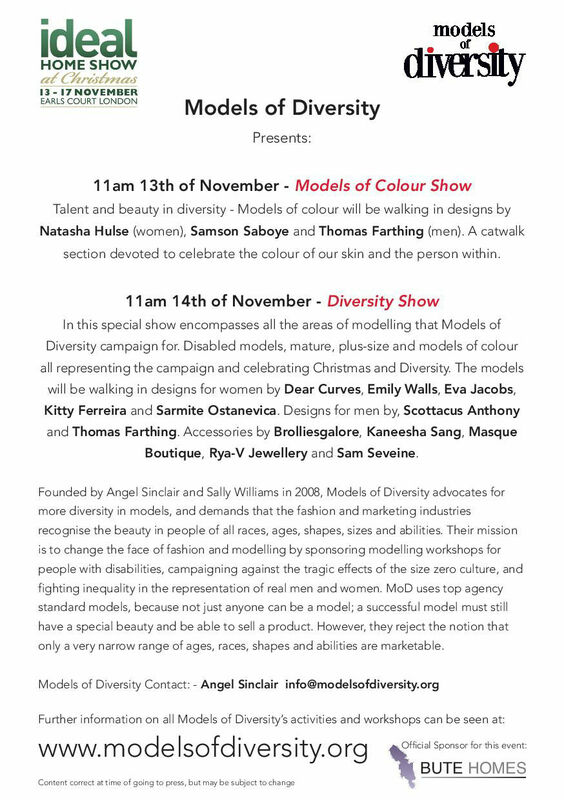 This Thursday 14th November, Kitty Ferreira’s collection will feature in the Models of Diversity show at the Ideal Home Show. For their last catwalk presentation before the Christmas season strikes, clothes will be worn by women of colour, plus sizes, disabled and mature models. The show will promote inclusive fashion, emphasizing the fact Kitty Ferreira’s exclusivity only refers to the fabrics. The designs are suitable for a variety of ages and body shapes, ranging from a petite size 6 to a voluptuous size 26. The Kitty Ferreira collection will be showcased at Earls Court Exhibition Centre as part of the Ideal Home Show in London. The catwalk will begin at 11am. to buy your ticket go online to www.idealhomeshowchristmas.co.uk.